Every once in a while, our employees come across “cool stuff.” We run one of our employees' discoveries in every TimePilot Times newsletter. These are the entries from our first 40 newsletters, dating back to 2011. To see "Cool Stuff" from our most recent newsletters, click here. To see all of our newsletters, click here. Do you have a place that needs a little more light? Or maybe a great Christmas decoration? 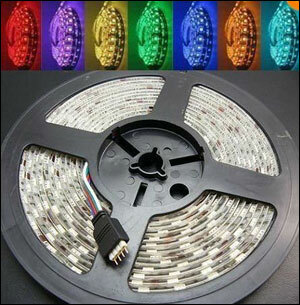 The Supernight LED strip might be the answer. It’s a 16-foot roll of lights that can be mounted anywhere. You just unroll the strip, cut it to size, and mount it with the adhesive strip on the back. The waterproof LEDs have a lifespan of more than 50,000 hours, low power consumption and little heat generation. With the included wireless remote control, you can have the lights display 16 colors, dim, flash or fade. You can also connect up to 3 16-foot rolls together. The kit includes a 16.4-foot strip holding 300 LEDs, remote control, power supply, and infrared control box. 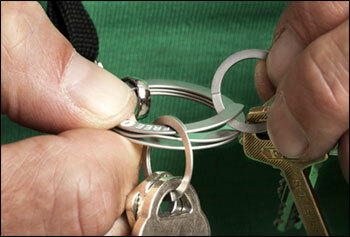 Ever break a fingernail trying to get keys onto or off your key ring? With the FreeKey System, you press the FreeKey logo on the ring and the end lifts up for easy access. Perfect for iButtons, too! 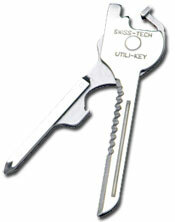 The FreeKey System was invented by a Swedish design firm that licensed the design to U.S. company, which makes it here. It's $6.49 for the main ring and three mini rings, or $4.49 for just the main ring. Feeling a little dried out? The air can get pretty dry in winter months, and adding humidity can make you more comfortable. But it's hard to do in an office or if you're traveling. 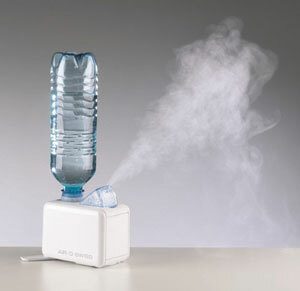 The Air-O-Swiss Travel Ultrasonic Humidifier uses regular water bottles as its reservoir and makes it easy to add humidity to your environment. It's available on Amazon for $49.99. Nibble solves that problem. 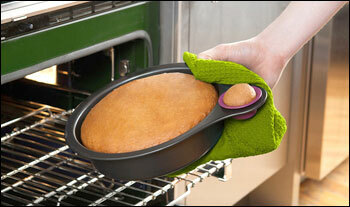 When you bake a cake with the Nibble pan, put a little batter into the cup on the side of the pan. Your sample will be ready in about 12 minutes. Taste-test the sample and you can decide to give the cake as a gift, keep it for yourself, dump it in the trash or, if it's really good, send it to us at TimePilot. Nibble, by Quirky, costs $5.00. It uses twigs and wood chips that you'll find at your campsite as fuel. No propane bottles to carry in and carry out. 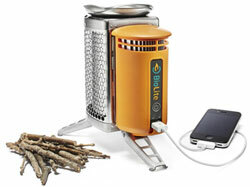 It converts some of the heat generated by the stove into power that will recharge a cell phone or headlamp. It might also be a nice thing to have if you lose power frequently or in the event of a natural disaster. The Biolite Camp Stove is $129.95 at the Biolite web site. 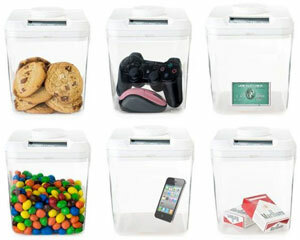 The Kitchen Safe is a cookie jar-like container with a time-lock lid. You fill the container with cookies or any other "forbidden" product, put on the lid and set the timer. You can't get to the contents until the time runs out. The timer can run from 1 minute to 10 days. The device is available with a clear container (as seen at right) or white container. Users have found it has helped them lose weight, reduce smoking, take medicine on time, cut spending and remove "distractions" (note the video game controller and cell phone in the photo!). Others have put a gift in the white version of the container and set the timer; the recipient can't see the gift or get it until the time runs out. This isn't the most "techy" of products, but it's one of those "slap-to-the-forehead, why-didn't-I-think-of-that" things. Let's say you're at the local fast-foot restaurant, picking up lunch for you and a co-worker. You've got two drinks, two bags and there aren't any cardboard drink carriers. Then you see the solution. It's a simple plastic bag with a handle, divided into two slots, each just the right size to hold up to a 32-oz. cup securely. We spotted a package of them attached to the side of a fast food restaurant's soft drink station. If your children use traditional toothbrushes, they probably seldom brush for the full 2 minutes that dentists recommend. 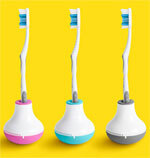 The Bobble Brush Timer, a weighted toothbrush stand with integrated timer, makes it fun. The $9.99 device comes in three colors and holds a toothbrush upright until it’s needed. When the child starts brushing, they turn the base to start the 2-minute timer. When the bell rings, it’s time to stop. Tip: Put a dot at the 1-minute mark on the timer to prompt your child to switch from brushing their upper teeth to brushing their lower teeth. Bobble Brush Timer at Quirky. RightPSI is an easy and inexpensive way to check the air pressure in your car, truck, motorcycle or bicycle tires. 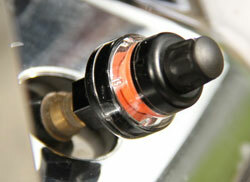 It screws on to your tire, replacing the valve cap, and changes color if the tire runs low on air or is overinflated. When you’re inflating your tires, you pump right through the RightPSI’s cap, so the device can tell you when you have exactly the right pressure. The maker of the RightPSI is raising money to produce the product—which has won the Popular Mechanics Editor's Choice Award for Outstanding Achievement in New Product Design and Innovation—on Kickstarter. There is a variety of choices: two for $15, four for $25, etc. Check it out at Kickstarter. Ever wanted to learn Spanish? How about French or Italian? Or maybe you speak French or Spanish and want to improve your English? Duolingo is the place for you. It’s a free service that turns the tedious process of learning a language into to a fun game. You can use it on their web site, www.Duolingo.com, or download their iPhone or Android app. It consists of a series of short lessons. As you progress through a lesson, you either add or lose “skill points.” One study found that in 34 hours on Duolingo you can learn as much as in a 130-hour college semester. It’s a great example of the intersection of two trends in technology: Gamification and Crowdsourcing. Gamification is the act of turning what might be a tedious task into a game by awarding points or badges. Crowdsourcing is using a group of people, each of whom does a small amount of the work, to complete a large task, instead of one person spending lots of time. In Duolingo’s case, the examples used in the lessons are actual text from web sites, and Duolingo has agreed to supply the text translated by their users to the web sites. Check it out at http://www.duolingo.com. This one isn't quite new, but this app is a must-have for those of us receiving a smartphone or tablet for the holidays. Did you ever hear a song—on TV, in a store or on the radio—and want to know its name and performer? Shazam can tell you. When you start the free app, it listens to the music through your phone's or tablet's microphone. After a few seconds, it identifies the song and will also tell you the artist and displays the lyrics. It even gives you the opportunity to immediately buy the song. Shazam is available for virtually any smartphone or tablet. Windows Phone users have a built-in alternative: Bing Audio. Your smartphone can do a lot more than make phone calls. You can download audio books and listen while exercising, driving or even working. Audible.com is a great place to get those books. You choose from thousands of books available, download your choices to your phone and start listening. You can buy individual books or a membership plan where you pay monthly. Their $14.95 monthly plan gives you one book a month and offers the first month free. You can cancel at any time. One of our employees has been a member for a dozen years. He downloads mysteries and doesn’t allow himself to listen to the book unless he’s exercising—that way he’s much more motivated to get a workout, and the mysteries keep him occupied. Whispersync for Voice. If you also own a Kindle e-book reader, you can buy the book in Kindle format and add the Audible narration. That lets you, for instance, read the first chapter-and-a-half of a book on your Kindle, then call up the audio book on your smartphone or MP3 player and the reading will continue where you left off on the Kindle. Immersion Reading. Got a Kindle Fire tablet? You can read the book on the tablet while at the same time hearing the narration—and as the lines are being read aloud, they’re being highlighted on the Kindle Fire screen. If English isn’t your first language, what a great way to learn! Sitting at your desk for more than three hours a day will cut your life expectancy,	according to experts. The solution: a standing desk. You can buy specially-made standing desks for hundreds of dollars, or you can build your own solution (shown at right) that rests atop your current desk for just $22 in parts from Ikea. The parts are available from Ikea's web site as well as at Ikea stores. 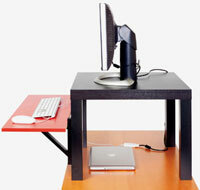 The designer calls it the "Standesk 2200." It's simply an end table with two brackets and a shelf attached to it. Here's a link to the instructions. Want something a little more sophisticated (and expensive)? Try these from Staand Up Desk. Anyone who does small repairs around the house knows that choosing the right socket from a 50-piece socket set often takes longer than making the repair itself. The Gator Grip eliminates the need to choose exactly the right size. Just push it on and start turning. It fits virtually anything that isn’t round: hex nuts and bolts from ¼-inch to 3/5 inch, eyebolts up to 2 inches, wing nuts, square nuts, broken nuts, hooks, etc. Inside the socket are 54 spring-loaded rods. 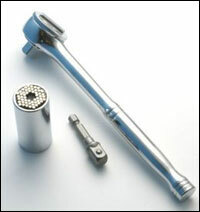 When you push the socket over a nut, some of the rods retract and the others surround the nut, giving you a good grip. The Gator Grip comes in several versions: You can buy just the socket or the socket, a ratchet and power driver adapter (so it can be used on a power drill). This might be just the thing for a great Father’s Day gift! This isn’t that new, but it’s certainly cool. Google AdWords is an advertising tool that lets the little guy compete with the big guys. You’ve probably seen the ads that appear across the top of the screen and down the right side when you do a search in Google. Those are placed by Google’s AdWords system. It’s called pay-per-click advertising. The benefit over traditional advertising is that you only pay when someone clicks on your ad. We use it and it has been very effective. You write the ad—just a few lines of text with a link to your web site. Then you give Google a list of keywords where you want your ad to appear. For instance, an ice cream stand might want to have its ad appear when someone does a search for “ice cream sundae” and for “ice cream cone.” Then you tell Google how much you’ll pay when someone clicks your ad and your maximum monthly budget. Now, you’re probably thinking, “My ice cream stand is in Andover, Mass.—why would I want to advertise all across the world?” Good question: You don’t have to. You can have Google target your ads only to people within a city, a region, a country or even a specific distance from your business. You can cancel at any time, or even turn off your ad for a few days if you want. Google gives you lots of help to get started. Here’s a link: http://www.google.com/adwords/index.html. Are you a new Windows 8 user? Do you miss the old “Start” button from Windows 7, XP and earlier? Microsoft may have taken it away in Windows 8, but it’s not hard to get it back. Pokki is a free download that restores a “Start” button to your Windows 8 computer’s desktop. Click the button	and, just like the old days, you can see your programs or shut down your computer. Here at TimePilot most of us are using Windows 8, and several of us have installed Pokki and like it very much. If you miss the old “Start” button, give Pokki a try. You can always uninstall it if you don’t like it. Pokki (Windows 8 add-on): https://www.pokki.com/windows-8-start-menu. Do you use Microsoft Excel? How often do you click your mouse when you use it? Let’s say you want to enter $5.42 into a cell. The typical way to handle it is to click the cell to choose it, enter 5.42, then click away to another cell, click the 5.42 cell again, right-click the cell, click “Format cells,” then click “Currency,” then click “OK.” By our count, that seven clicks. There’s gotta be a better way, right? There is: Click the cell to choose it, enter 5.42, then click away to another cell, click the 5.42 cell again , then hold down the “Shift” and the “Control” keys on your keyboard at the same time and press the “$” key. Three clicks and you’re done. 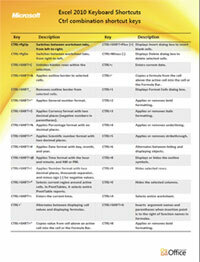 Microsoft has written up a cheat sheet with lots more of these shortcuts. No one will use all of them (or even half! ), but you might find exactly the shortcut to save you some time. It’s available here. If you have trouble waking up in the morning—and you have an Android phone—this may be the app for you. This app uses sleep cycle science to wake you up when you’re ready—not just at a specified time. According to the developer, near the end of our night’s sleep, we alternate 30-minute periods of deep sleep and 30-minute periods of light sleep. If you’re awakened by a traditional alarm during a deep sleep cycle, you won’t feel particularly rested. But if you’re awakened during a light sleep cycle—even if it’s a half-hour earlier—you’ll feel better. Let’s say you set your Gentle Alarm for a 7 a.m. wakeup. 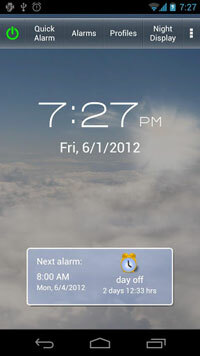 At 6:30 a.m., the App will play a fairly quiet alarm. If you’re in a light sleep cycle, you’ll wake up a half-hour early, but feel refreshed. If you’re in a deep sleep cycle, you’ll sleep right through the quiet alarm and be awakened by a louder alarm at 7 a.m. when you’re presumably in a light sleep cycle. One of our employees has tried it and says it worked for him. The app costs $2.78 at the developer’s web site. Sorry, iPhone, Windows Phone and Blackberry users—no version for us yet. Looking for an unusual and inexpensive gift for Christmas? Here’s an idea: Give a person their very own font—in their own handwriting. You can use the font anywhere you’d use any font: on printed documents, e-mails, etc. Here’s how it works: You download a form from Writing-Fonts.com and print it on your printer. The form has spaces for you to write the alphabet, numbers, various punctuation marks and your signature. Then scan the form and upload it to Writing-Fonts. They’ll convert it to a font, which you download, ready for use. The web site offers clear instructions for the whole process, which takes about 15 minutes. Each font costs $9.95. Also, if your handwriting is like ours—just about impossible to decipher—Writing-Fonts.com also offers 12 very legible handwritten fonts for free. Most modern smartphones have high-quality still and movie cameras. If you've got an iPhone 4 (now a couple of generations old), you've also got a 5 megapixel still camera and a high-definition video camera in your pocket. To take advantage of them to the fullest, you need very steady hands. Or a Gorillapod Mobile for iPhone 4 and iPhone 4S. The GorillaPod Mobile is a desktop tripod that will hold your phone steady, but its legs are also bendable, so you can adjust the tripod's height or even hang it upside down from a pipe or a railing. It's also good for watching videos on your iPhone. School has been in session for about a month, and right around now some kids have started falling behind in their math or science classes. As a parent, you want to help, but it's been a long time since you were in school and helping is difficult. Khan Academy to the rescue! Khan Academy is a completely free online "school" with thousands of short videos explaining everything from basic addition and subtraction and telling time to calculus, statistics, biology, chemistry, physics, history and economics. Other videos take apart a digital camera to see what's inside and even feature NBA star LeBron James asking and answering science questions. Each video runs about 10 minutes and does a wonderful job explaining its topic. It's a perfect way for a student to have a concept explained in a different way to help them understand it, or for an adult to "fill in the gaps." One staffer here at TimePilot is planning to watch the calculus videos—he passed calculus in college, but understood very little of it. Visit Khan Academy at http://www.khanacademy.org. 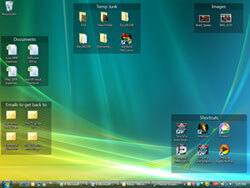 This free software helps you keep your Windows desktop icons organized. You set up boxes (you can see five of them on the screenshot at right), give each box a title, and drag your icons into them. The boxes are movable and sizable and keep your icons "corralled." Learn more and download the software here. SketchUp is a free, easy-to-use 3-D drawing program that turns you into an architect, designer or artist. It was popularized by Google and sold in early 2012 to a company called Trimble. If you’re designing a house, a garden or a piece of furniture, for instance, you can draw it in Sketchup to see how it will look in three dimensions. There are online libraries of pre-made elements (windows, doors, etc.) that you can add to your design. If you're an artist, you can make things like this, by Australia-based artist Thomas Pavitte. Children catch on quickly to Sketchup, but it’s so powerful that architects use it too. It’s also found a very unexpected fan base: children with autism. One of our employees, a woodworker in his free time, uses the program to design the furniture he builds. You can download Sketchup here. Do people fall asleep during your Powerpoint presentations? Even worse, do you fall asleep during your Powerpoint presentations? Maybe you should try Prezi. Prezi is a free online tool that helps you create animated presentations. In Powerpoint, you move from slide to slide, with no real continuity. The best way to describe Prezi is to imagine scattering all your content on a giant whiteboard, then flying from topic to topic on the board, zooming in and out where necessary. You can use text, graphics, photos, even videos. Want to see an example? Click the image at right. Click the arrow at the bottom of the Prezi screen to advance through the presentation. Prezi is free for users who don’t mind having their presentations appear on the Prezi web site. If you want to keep your presentations private, the cost is $59 a year; for additional features, it’s $159 a year. Need help creating your Prezi? Here’s a cheat sheet. Did you ever get a warning light on your car’s dashboard and wonder, "What does that mean?" You can find out with the Bluetooth ELM 327 OBD2 Car Diagnostic Interface Code Scanner. This little box plugs into the On Board Diagnostics (OBD) port in your car and gives you all kinds of information that once was available only at the dealer or repair shop. 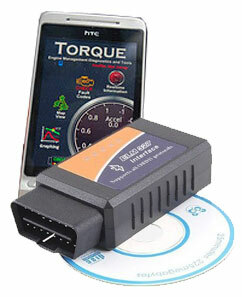 It comes with software that displays the information in real time on a PC, or if you add the free Torque Lite app to your Android smartphone (available at your favorite Android app store), you don’t even need a computer. The data from your engine is transmitted via Bluetooth from the scanner to the smartphone. Diagnostic trouble codes, both generic and manufacturer-specific, and their meanings. The Swiss+Tech Utili-Key 6-in-1 is a device that's just a little bigger than an iButton, but it contains six high-quality tools, fits on a keychain and weighs just half an ounce. We’re mainly coffee drinkers here at TimePilot (we like PapaNicholas Coffee, roasted a few miles from our offices in Batavia), but occasionally we like a cup of tea. Teabags are fine in a pinch, but there’s no need for them anymore with the IngenuiTEA, which is made by Adagio Teas. 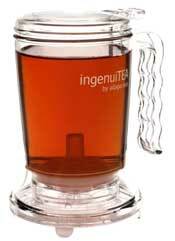 All you do is put the loose tea in the IngenuiTEA cup and fill it with hot water. Let it steep, then put the cup on top of your mug. A valve opens in the bottom of the cup, filtering the tea and filling your mug. This is a new model—no paper filters needed. It’s simple to clean, dishwasher safe and BPA-free. A pretty ingenious design and fun to use. It’s $19 from the Adagio web site. 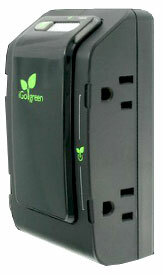 The iGo Green Power Smart Wall is a surge protector with four outlets: two "smart" outlets and two regular "always-on" outlets. This device's smart outlets cut power when it's not needed, saving you money, helping the environment and possibly extending the life of your rechargeable batteries. The outlets are ideal for items like cell phone or laptop chargers, which usually draw power even when your phone or laptop isn't attached. When you attach your cell phone or laptop to be charged, the outlet wakes up and begins feeding power to the charger. Note: If you use this product with TimePilot Vetro, use the "always-on" outlets—the clock requires a consistent power source. Many	of our customers are moving up to Windows 7, the latest operating system from Microsoft. It has all kinds of new features, but it's not particularly easy to find out how to use them. Philadelphia programmer Chris Strosser, who also runs a web site called WebJawns.com, has created a downloadable Windows 7 cheat sheet listing many of its "hidden" features. It's a PDF document, so you'll need the free Adobe Acrobat Reader to view it. If you don't have Acrobat Reader, you can download it here. If you use nothing else, make sure you try out the "Snap" and "Peek" features Strosser describes on the first page of the sheet. The whiteboards here at TimePilot have gotten quite a workout over the years. In fact, they absorbed enough dry-erase ink that no amount of cleaning could make them white again. So we decided to try a product we found at our local hardware store: Rust-Oleum Dry Erase Paint. The maker claims it will renew whiteboards as well as turn any drywall, Masonite, wood, cement or metal surface into a whiteboard. You could paint a wall with the stuff if you wanted to. We tried it over the weekend on one of our whiteboards, and it worked pretty well. Like any painting project, the secret is in the preparation. If you don't prep the surface just as instructed, it won't work as well. Another secret with this paint is that it'll take at least four coats to get a good hard surface. This is the heavy duty shipping scale that we use here at TimePilot, and we love it. 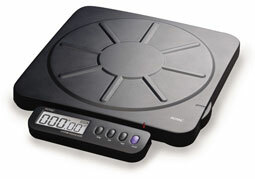 The Royal DSS Pro Shipping Scale has a wireless remote display that makes it easy to read. We have the base sitting on a shipping table and the display mounted on the wall at eye level.This way, the package doesn't cover the display when you're trying to read it. Occasionally several of our health-conscious employees move the base to the floor and use the scale to check their own weight. Fortunately (for the scale and for us), no one comes close to the scale’s 400-pound capacity. The remote display runs on three AA batteries and functions as a digital clock when the scale isn’t being used. The base runs off AC power (an AC adapter is included) or can run off four AA batteries. This is not designed to be a postal scale: It’s not going to be accurate if you’re mailing a letter and can’t decide whether it needs one stamp or two. But if you’re shipping bulkier things, it might just be perfect. We’ve seen it at Amazon.com for just over $60 and for a little less at Sam’s Club. Note: Full disclosure: Royal is a timeclock partner with TimePilot, but we wouldn’t recommend the scale if we didn’t use it every day and truly like it. With school starting up soon (sorry, kids! ), you might be thinking about notebooks. We've discovered a very interesting line of notebooks from a Swedish company called Whitelines. 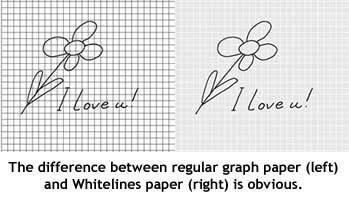 While most notebooks use white paper with blue lines, the paper in Whitelines' notebooks is a very light gray with white lines. We've found that they're easier to write in and easier to read—the blue lines aren't as distracting—and they're perfect if you're sketching as well as writing. An added benefit is that if you make a copy or a scan of the paper, the gray background and white lines vanish, leaving only your work neatly arranged on the page. The notebooks are available with college-lined paper as well as with graph paper. You can get Whitelines notebooks at stationery stores, bookstores and at Amazon.com. The Whitelines web site is http://www.whitelines.se/. After a long, hard day, some of us here at TimePilot like to unwind with a glass of wine. Others like a glass of red for its heart-healthy qualities. Either way, the toughest part is getting that darn cork out of the bottle. But we've found a device that makes it easy. It's called the Electric Rabbit corkscrew. It's a cylinder with	a battery-powered corkscrew inside. All you have to do is put the cylinder over the neck of the wine bottle and push a button. In a few seconds, the cork is out. The Electric Rabbit is made by Metrokane. You can read about it here and see a video demo of it here. The manufacturer's suggested retail price is $50, but we've seen it for as low as $45. What’s that thing on the left? It looks like somebody spilled ink on my screen! Don’t worry—it’s called a QR Code, and it’s the latest thing in marketing. You’ve probably seen them in magazines or at stores. If you’ve been in Chicago lately, there’s a billboard-sized one at Clark and Harrison Streets. If you’ve got a smartphone—iPhone, Android or Windows—you can use them. An app on your phone uses the phone’s camera to scan the code, and your phone immediately displays a web site or a YouTube video. Companies use them to drive traffic to their web sites or to provide more product information. For instance, a QR code on a package can direct the smartphone user to a YouTube video giving more details about the product. The billboard in Chicago offers a daily deal at one of the many restaurants in the neighborhood—one day it’s half-price shrimp tacos, another day it’s 57% off pizza and beer. A QR Code is essentially a two-dimensional bar code, and because it scans horizontally and vertically, it can carry more than 200 times the amount of information a traditional bar code can carry. It also can be in color, unlike a regular bar code. Need an app for your smartphone to read QR codes? Just search for “QR code” at your app store and you’ll find dozens of different ones. Here at TimePilot, we like NeoReader for the iPhone and Bar Code Scanner by ZXing Team for the Android. Do you ever find yourself e-mailing documents to yourself so you can work on them at home? Or maybe trying to send someone an e-mail containing a file that their e-mail system can’t handle? How about burning file after file to CD just so they’re backed up? We’ve found a pretty cool free service that solves all these problems. It’s called Dropbox. Here’s how it works: You go to Dropbox.com, sign up with an e-mail address and password, and, optionally, install a small software program. As long as you have an internet connection, anything you put in your Dropbox is immediately synchronized on Dropbox’s	servers. Make a change to a file, and the new version is immediately sent to Dropbox. But Dropbox can do a lot more than that. Add your Dropbox account to your other computers and smart phones, and your files can be accessed on any of those devices. When you make a change to a file, the change is synchronized across all of your devices. In addition, you can create a folder within your Dropbox, and share the contents of just that folder with another person anywhere in the world. Anything you put in that particular folder will be copied to the Dropbox servers, and also sent instantly to the other user’s shared folder in Dropbox. Here’s one way this can be used: One of our employees had a son living in China, and when the son wanted to share pictures with his parents, he’d simply put them in his shared Dropbox folder. Within seconds, they were backed up and copies had arrived on his parents’ computer in the U.S.
We’re pretty excited about this technology, and TimePilot is in the early stages of using Dropbox to provide better support to its customers. That's why we think the One2Flush Toilet Conversion Kit (right), a product sold by our neighbors at Marsh Products, is so cool. 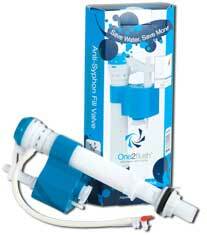 It replaces the mechanism in your toilet tank and can save the average family 30 gallons of water a day. The secret is in its dual flush design: Push the handle one way for liquids or the other way for solids, and the chamber knows just how much water to use—and no more. For details, visit www.ecoMarsh.com. Pretty much everyone here at TimePilot is a pet owner. One of our employees has a very finicky (and, he hastens to add, intelligent and good-looking) cat. The cat needs to take medication twice a day, but refuses to accept pills or liquids, no matter how well they’re hidden in food or treats. After trying everything else, the owner’s vet prescribed the medicine in a “Twist-a-Dose” applicator. The medicine is “painted” into the inside of the cat’s ear with a device that looks like a felt-tip pen. Two twists of the pen dispense just the right dose. It’s been a lifesaver. The cat doesn’t fight the medicine; she just curls up and tolerates the momentary “ear rub.” The “Twist-a-Dose” applicator can also be used on dogs and other household pets and with a variety of medicines. Check with your veterinarian for more information. The people at Google have put together a cheatsheet with some of their most popular functions. You can download a copy here. To see "Cool Stuff" from our most recent newsletters, click here.